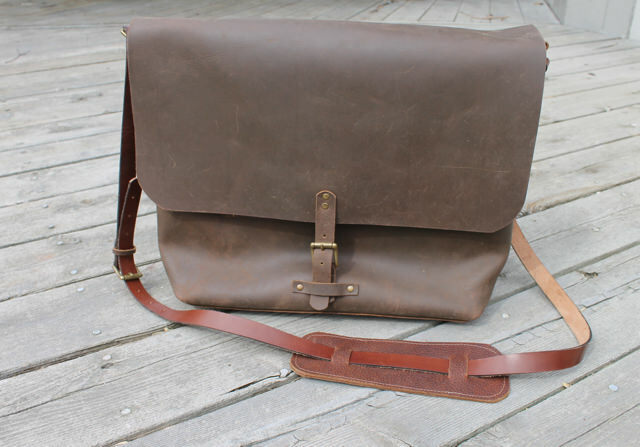 the leather laptop bag is done! 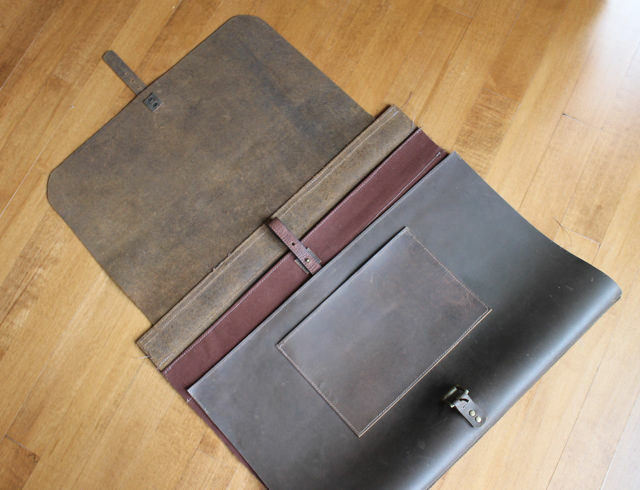 The leather laptop bag is finished. This is the first time I have worked with oily pull-up leather and it is both beautiful and challenging. I love the finish–it has a great look and feel and will wear well. The challenge comes because of its heft–sewing this was a real physical experience, especially turning it inside out. The bag has a minimalist look, simple lines, simple pockets and simple hardware. 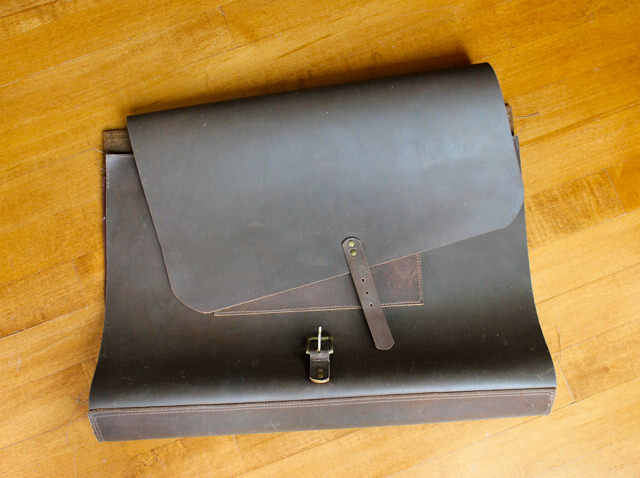 It is designed to carry a 14″ laptop as well as the other things you need for your work day. It has a finished leather strap with vintage buckle and leather shoulder protector. It also has a front buckle closure, a quick grab handle and inside key ring. 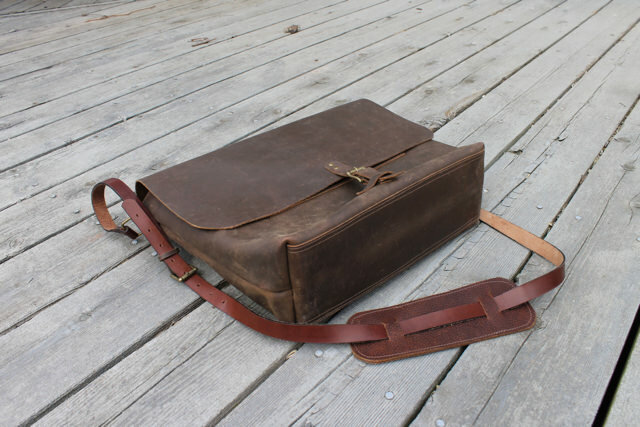 There are two outside pockets and one inside as well as a waxed canvas compartment with knob closure for the computer. Overall measurements 18″ x 12″ x 4″. It is shown here with a 13″ macbook. 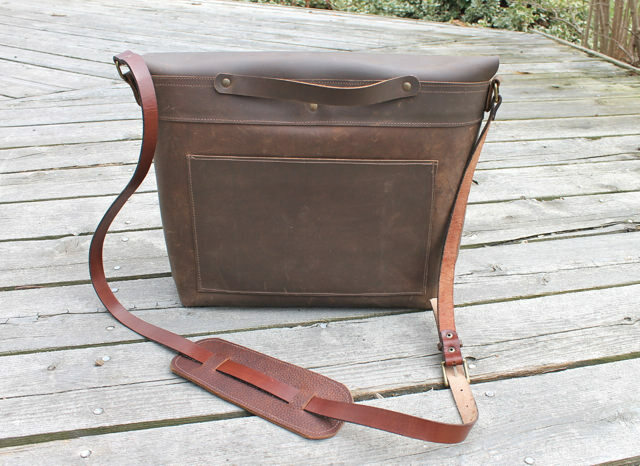 I’ve been working on a new messenger bag for the last little while. 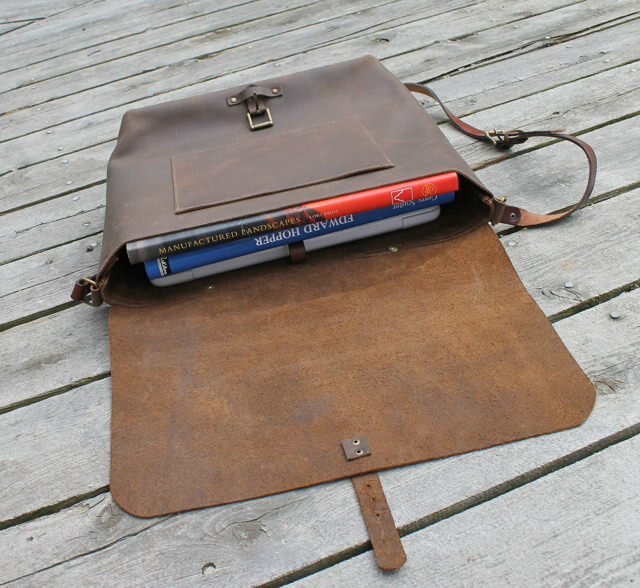 It is designed to hold a large macbook and the other essentials needed for the work day. 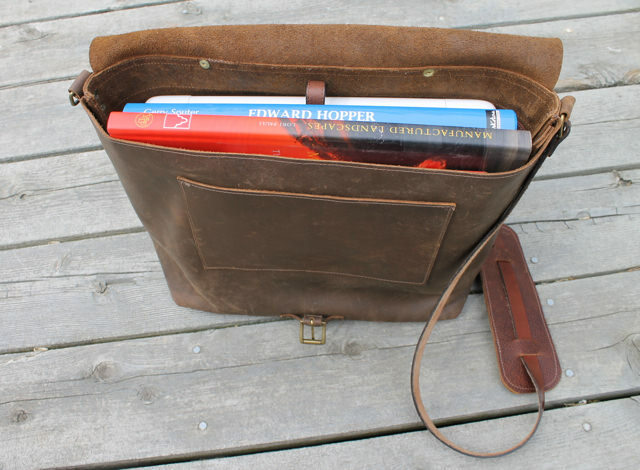 The bag is made of beautiful heavy leather which stands on its own. Hardware and design details are simple and understated. It has a double bottom and three pockets, two outside and one inside, and a front buckle closure. 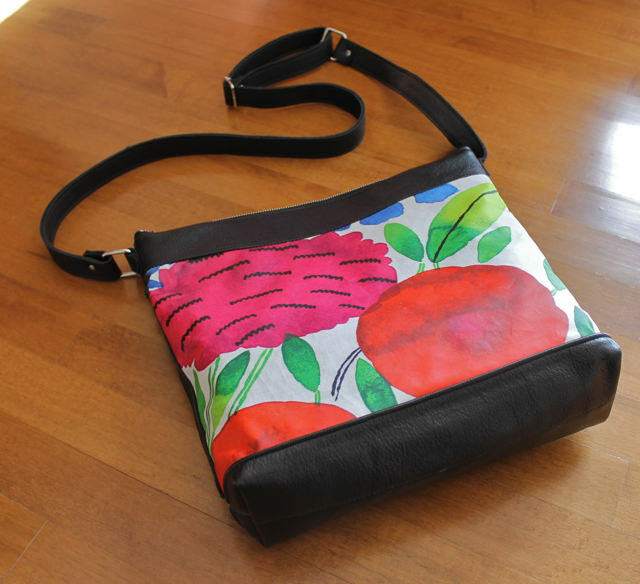 Still to come is the leather shoulder strap with a buckle adjustment. Every step of the way has been a big learning , but it is finally coming together. Next time you check, it will, I hope, be ready for action. 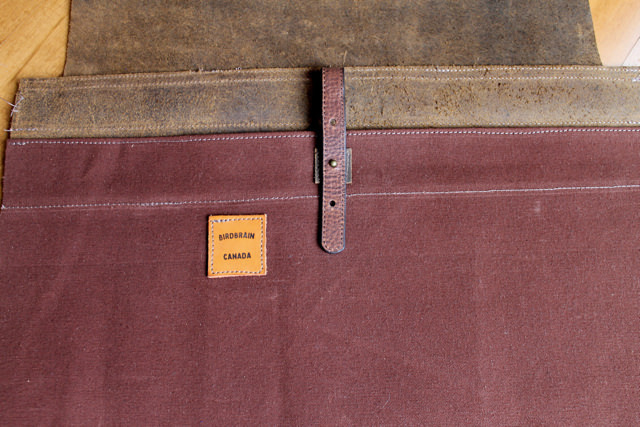 Inside is a brown waxed canvas compartment with a knob closure for the laptop. This photo also gives a good view of my label which I made with the new birdbrain branding iron. Today I received five pieces of hooking from Matangwe, Kenya. 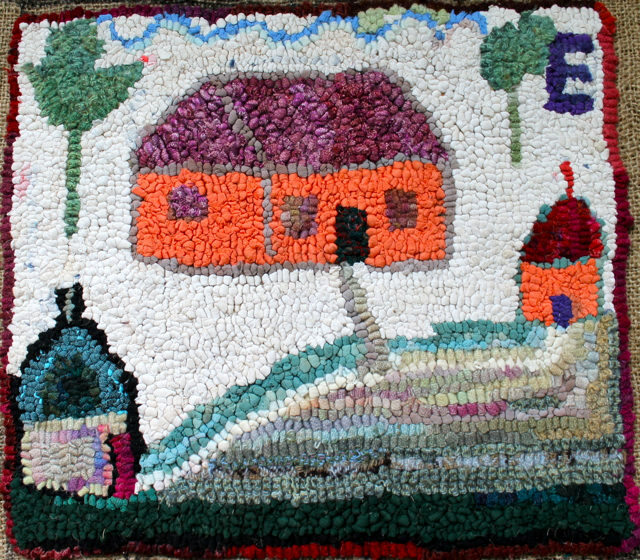 Those of you who follow this blog know that I spent my February in Matangwe from 2012 until 2015 teaching the women to hook rugs. I knew that the women with whom I had worked had the skills to make great rugs and I hoped that they would continue to produce high quality pieces of work on their own. Their lives are not easy and they have much work to take up their time. So I was delighted to receive a few pieces today and I hope that the women will continue to hook so that other volunteers will bring more pieces back. Every piece sold in the gallery last year and there will be much interest in these new pieces. The colours and designs are wonderful, evoking the Kenyan countryside. This section and a small spot in the top right corner for the bird signature are all I have left to hook–about two days’ worth. However…before I have even finished, I’ve become obsessed with correcting some of the very early loops. Now that I have a view of the whole I can see where some of the early sections are jarring. I began the rug with the quotation at either end, hooking in circles with an off-the-bolt mid-blue stripe and adding strips of similar colour and value. From there I had the idea of moving into green and then back to blue in the centre as I hooked around the 65 houses. The ends of the rug with the quotation are quieter, but I still want it all to work as a whole. 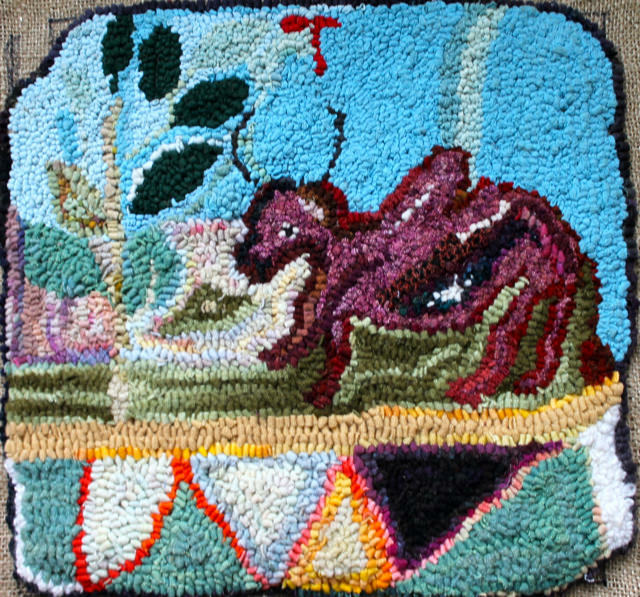 The rug taught me as I went along how to make a smooth transition from colour to colour while keeping an interesting pattern of circles. I learned that smaller circles are better, as well as staying within a close value range. As I look at the whole nearly-completed rug, I realize that the first transition in colour below the quotations is to0 defined. I can see the divide between colours like a line across the rug. So I’ve been ripping out and re-hooking, trying to make a seamless transition from colour to colour. 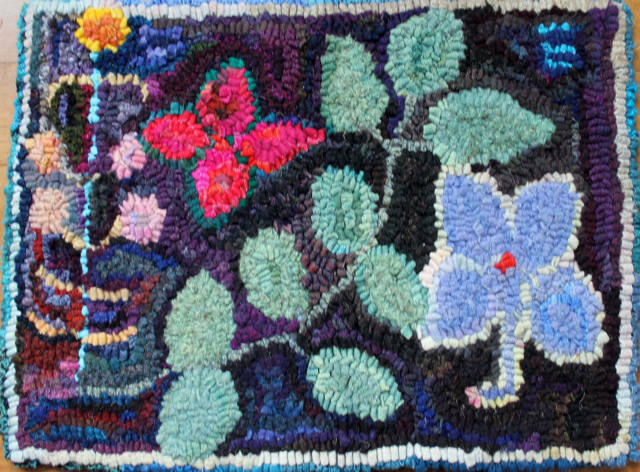 This rug has been three years in the making, not non-stop hooking by any means, but always in my mind. So it is fine that it is taking a little longer. I am learning as I go. After all, the rug is about how we live our lives. And imagine how long it will take to whip! I am sure to be devoting many evening hours on the cottage porch this summer to that little task. 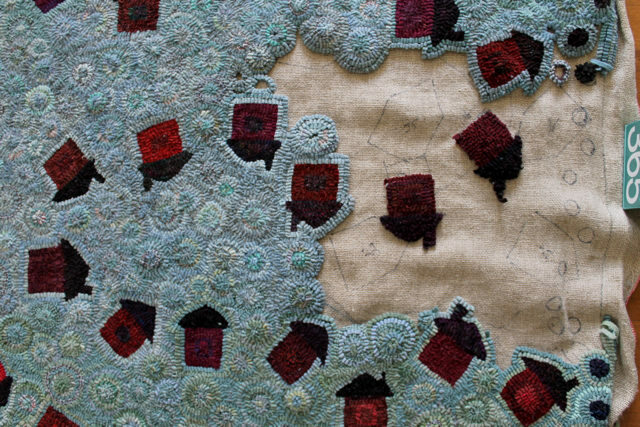 For an overview of the progress of this 5’x7′ somewhat biographical rug, just type Annie in the search box. Last week I went on a little road trip. I started at the train station in my city. This is a view outside from the new monstrosity to one of my favourite buildings–the original 1856 Grand Trunk station. It is standing empty now, but luckily protected as a heritage site. I got the drawing done standing looking out the window, and then had to hurry to catch the train–using the two elevators (!) where we used to be able to just step outside. I added the paint later. This sketch if from day two of the trip. 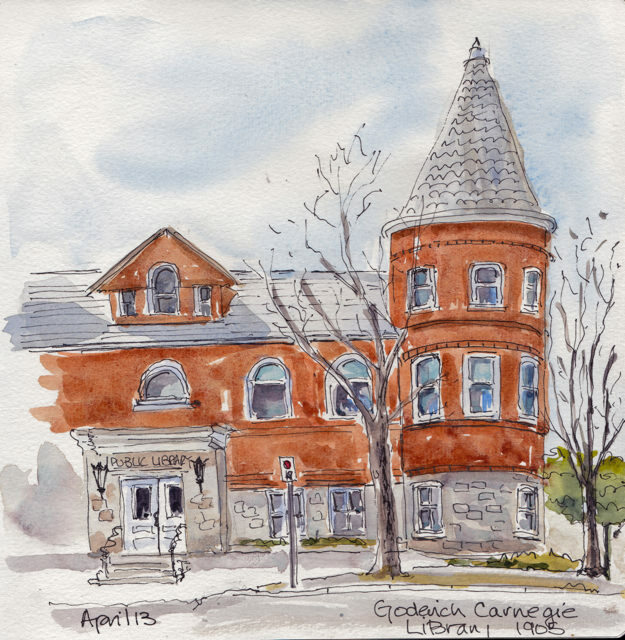 We drove to north-west Goderich on the shores of Lake Huron and in the late afternoon sunshine we leaned against the car and sketched this imposing 1905 Carnegie Library. 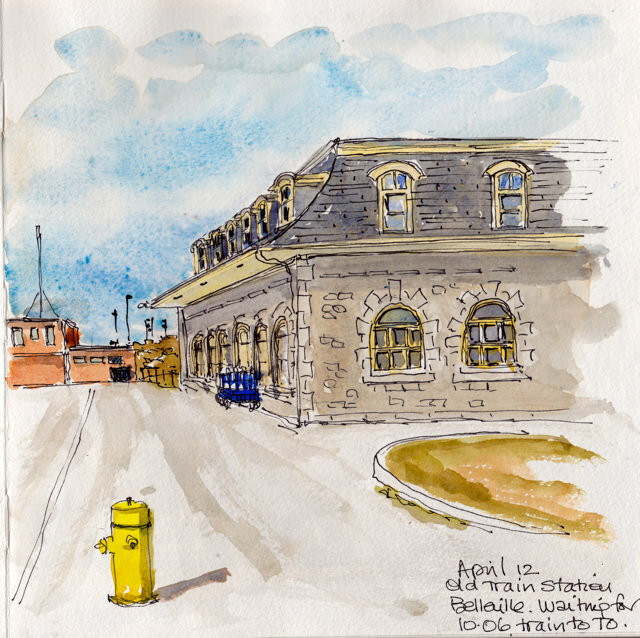 There are many towers in Goderich and I was able to sketch a few others. 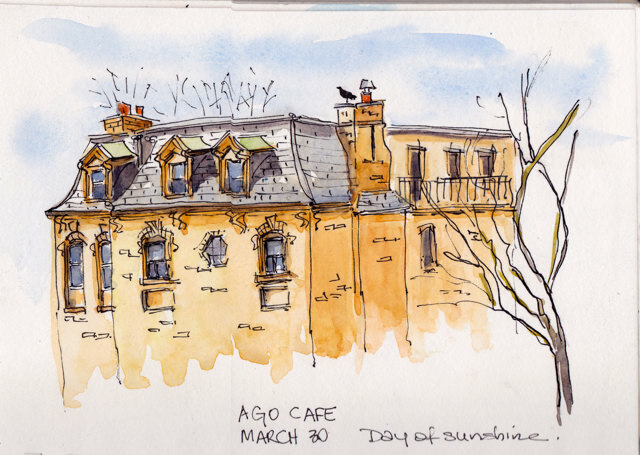 We had a week of beautiful spring weather and by Friday I could sit outside to sketch. I’ll post more sketches of the trip later this week. I bought this coated cotton fabric in Dublin last fall. The delightful birds still make me smile, every time I look at them. 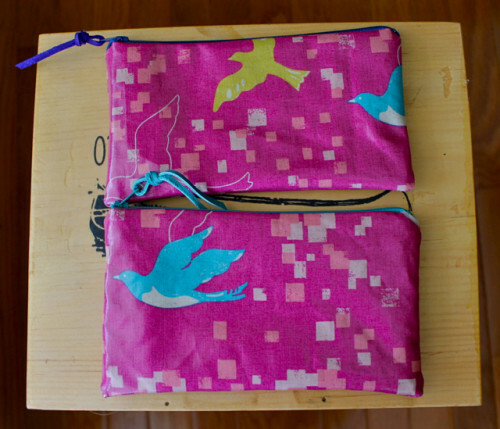 I’ve made a dozen pouches out of the fabric (there is only one left in the on-line store). 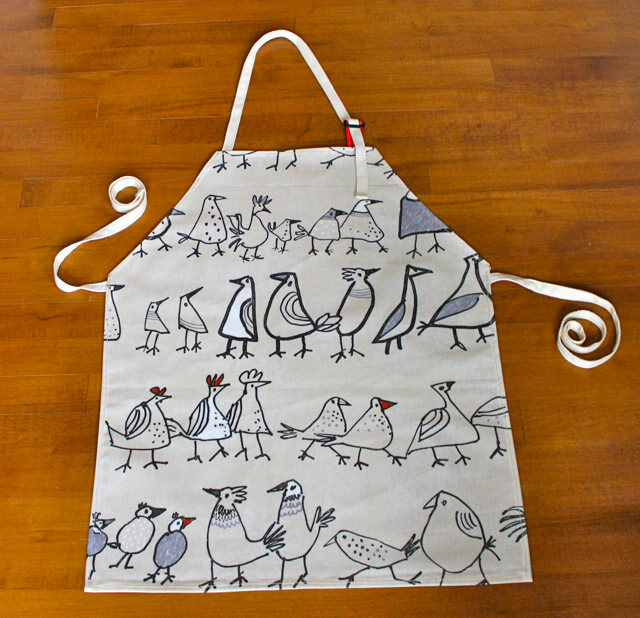 And there was just enough left to make a couple of aprons and a tote or two. Here is the first one–it will wipe clean and has cotton ties with an adjustable neck band. I’ve had a couple of requests for coated cotton pouches for travel. I spent an afternoon this week using up some remnants to make a few small makeup bags, big enough for a tooth brush and other travel essentials, but compact enough to fit in your tote. And to give a boost of colour! 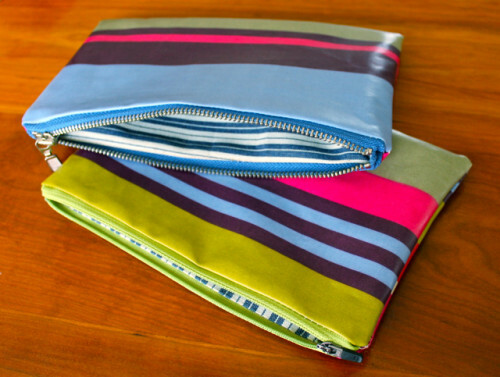 From the left two striped coated cotton from Chartres, one with a lime zipper one with a cobalt one. Then two magenta flying birds with cobalt and fuchsia zippers and then I could not resist two more wonky birds. 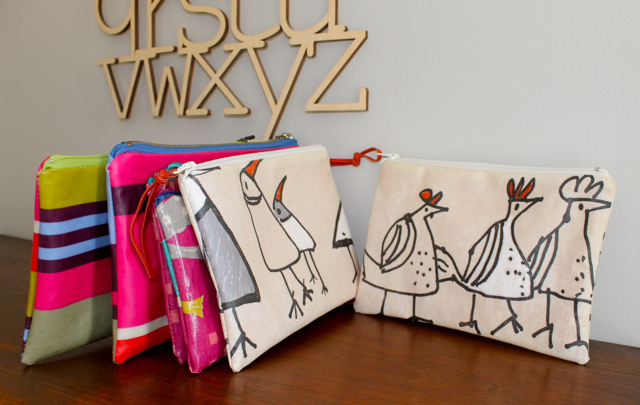 The wonky birds are lined with water-resistant orange waxed canvas. The remaining are lined with crisp blue and white striped canvas. A few of these will be in the shop very soon. I was in Toronto for a few days last week. One of my favourite places is the Art Gallery of Ontario. I like to make a trek to my favourites, David Milne and Lauren Harris. and then head to the cappuccino bar which overlooks Dundas Street and its row of Victorian houses. It was a sunny day, something which has been very rare lately, and I had enough time to complete two sketches of these elaborate houses. 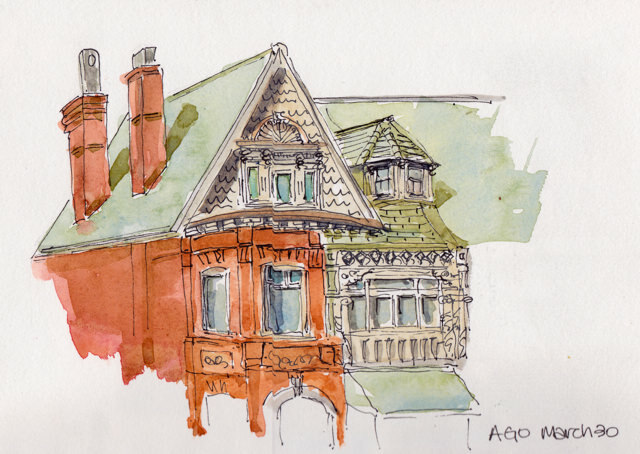 I like the sense of calm that comes over me when sketching, even in the centre of a busy city, and I love to get to know a building by sketching it. 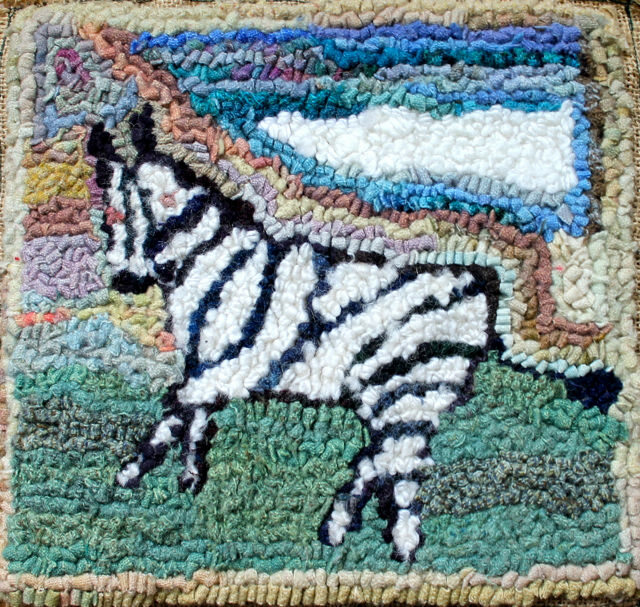 My Annie rug is too big to leave the house now…so I’ve been working on a few small pieces. I seem to have houses on the brain (Annie has 65 and counting) and it’s interesting how hooking and sketching inform one another. 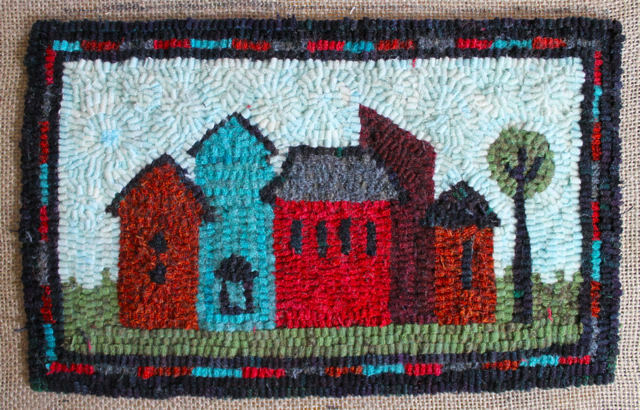 I’m thinking of doing a series of these small mats, working with shapes, values and colour and rows of houses. 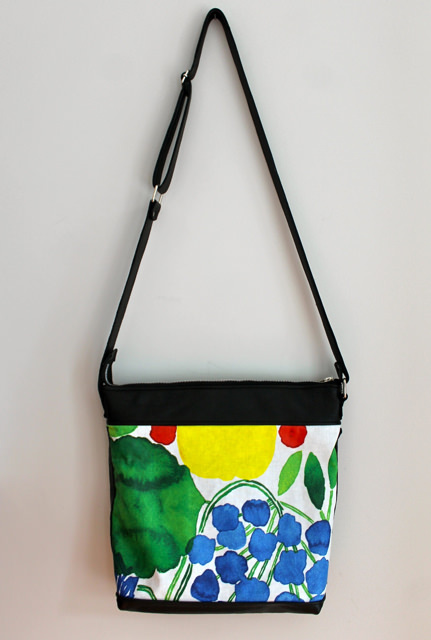 Before I tell you about the new watercolour bag, I have a short report. I was away last week for a few days travelling by train with two of my bags. 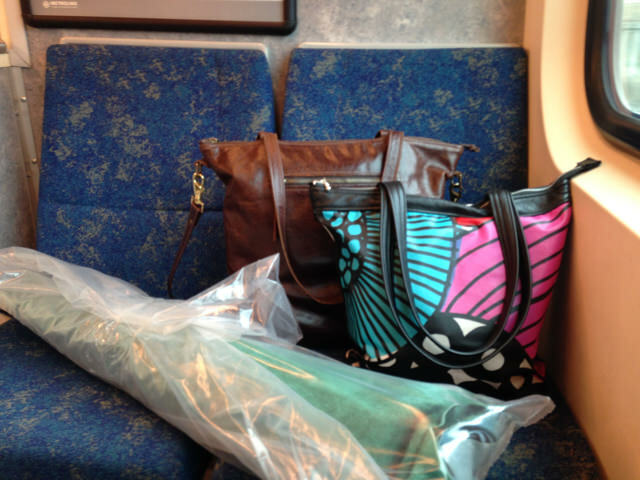 You can see them here on the GO train with a bundle of new leather wrapped in plastic. (More on that later, but you might be able to see the beautiful emerald colour!) Both days were non-stop heavy rain and I was pleased to see that the bags, one leather and one coated cotton, survived the deluge beautifully. Now on to the new bag. I have been saving a piece of Marimekko coated cotton in a large watercolour floral print. 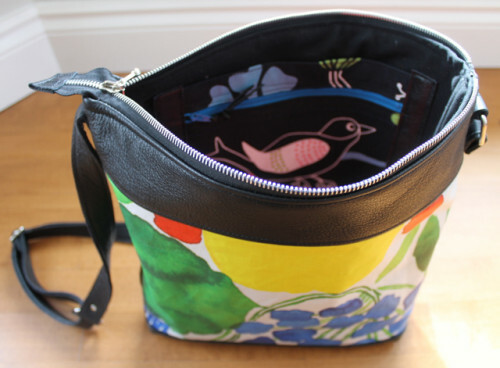 Today I made one section of it into a cross-body tote, 14″ x 12″ x 3″. I am very pleased with the result. Even though the print is large, it works in a smaller piece, and the colours are stunning. 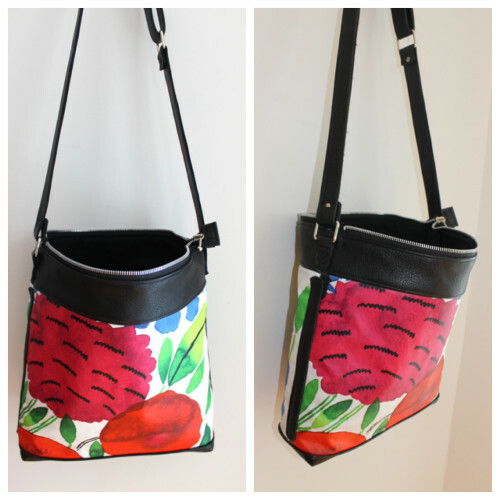 The leather on this bag is a beautiful recycled pebbly black and it works so well with the print. and cool blue, green and yellow on the other. Inside it has a zip/slip canvas pocket on one side and a double leather pocket on the other for phone and keys. Durable metal zipper and hardware finish it well. 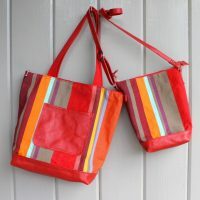 This is one great bag for spring and summer.